With a new PBS documentary coming on our Mister Rogers, along with a movie starring Tom Hanks as Fred Rogers in the works, it’s a good time to look back on this gentle man and what he taught. For a couple of years I had a newspaper column that appeared every four weeks in the Daily Spectrum, a newspaper covering St. George and Cedar City, Utah. This column was written in April 2003,shortly after Mister Roger’s death. 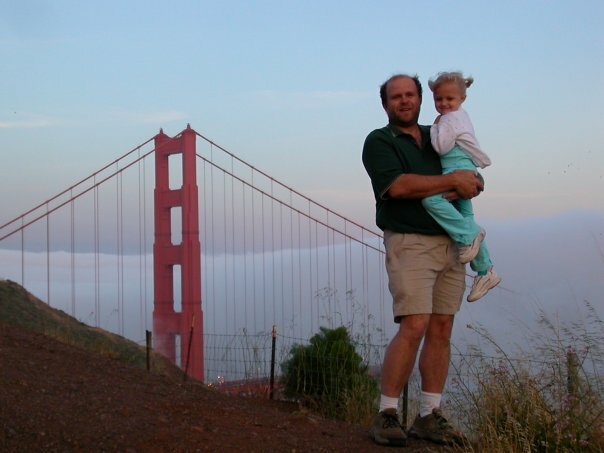 The photo on the left is of me and my daughter in San Francisco in 2002. “Daddy, are you sad Mister Rogers died?” My five-year-old daughter, with a reassuring voice, played the role of a good neighbor as she expressed concern for my emotional well being. Daddies don’t need to earn the admiration of their daughters. That aside, I discovered it was worth a few extra points to let my daughter know Mister Rogers, like me, was a Presbyterian minister and that we had both graduated from Pittsburgh Theological Seminary. In her eyes, that made Mister Rogers a personal friend of mine even though we attended the institution decades apart. We may not have been friends, but we were residents of the same neighborhood. To many, Mister Rogers seemed old fashion. His trademark cardigan sweaters and slippers were often targets of ridicule. But if image ever bothered Mister Rogers, he didn’t let it show. He reached his audience with his simple caring ways. His show offered children, including my daughter, relief. Their worlds are often chaotic. In contrast, Mister Rogers would walk slowly onto the set, replacing his jacket with a sweater. He always hung his jacket in the closet. His entrance provided a welcome change of pace for kids use to parents coming in, throwing their jacket on the back of a chair and collapsing in the recliner. Rogers’ meticulous ways demonstrated a safe and orderly world where adults have time for children and treat them as if they are important. In times like this, when we are bombarded with images of death and destruction, when terrorists long to destroy much of what we value, and when a virus has people afraid of traveling, our children need to be reassured that we are there for them. Even though we cannot control the future, they need to know that we have their best interest at heart. When Jesus was asked, “who is my neighbor?” he surprised his audience by telling the story of the Good Samaritan. A neighbor is someone who cares. A neighbor is someone who takes our best interest to heart. In this world filled with fear and conflict, we need a few more Mister Rogers asking us, “won’t you be, won’t you please, please won’t you be my neighbor?” “Yes,” I told my daughter, “I’m sad about Mister Rogers’ death.” We’re going to miss him. Yes, Jeff, thanks. Still very timely some 15 years later. I have not seen the documentary but have heard great things about it. I’m still learning new things daily without doing anything other than reading blogs! Thanks for the story. For me, even going into my adulthood Mr. Rogers was a rock of stability. I didn’t watch his show as I got older, but just knowing he was around was a comfort. Mister Rogers was a wonderful man. I didn’t know there was going to be a documentary made of him. That would explain all the Mister Roger videos appearing on Facebook. Wish we had more people like him. Well written, Jeff. You caught both the form and the content, nicely cradled in your daughter’s care. Kids need him today more than ever. Just hearing his voice is soothing, isn’t it? Wanted to let you know that even though I have added this new blog to my reading list, it never has shown up in my feed. I have no idea why, but it must be a conflict with Blogger. I don’t remember ever watching Mr. Rogers as a kid, but I have learned a lot about him since his death. He was an interesting guy. I’ll have to check out the documentary. Mister Rogers was unique and wonderful. His calm and gentle ways welcomed children everywhere to his show which became a safe haven for many. He is indeed missed.